If Microsoft makes an announcement and nobody is there to hear it, does it still make a noise? Once again, as it did with the news about Steve Ballmer's impending, um, retirement, Microsoft dropped a bomb this week at a time when most Americans were off doing something else. OK, we realize that Microsoft announced its impending acquisition of Nokia's devices and services divisions in Finland, where Nokia is headquartered, and that the world does not actually end where American beaches plunge into the sea. Still, most of the tech press, pretty much all of Wall Street and probably most folks who work for Microsoft were asleep or otherwise occupied when the company revealed its latest blockbuster move overnight Eastern Daylight Time time on Tuesday, just on the other side of the Labor Day holiday here in the United States. In any case, Microsoft's $7 billion buyout of most of the company one of its former execs was running has made, predictably, plenty of noise. The deal has put Stephen Elop, Nokia CEO, clearly at the top of the list to be next chief executive of Microsoft, although we think it's safe to say that Nokia's performance during Elop's tenure has been less than stellar. (Then again, the company was sliding into irrelevancy when he got there, not unlike the company that's buying most of Nokia now.) It has also drawn some praise, some ambivalence, a lot of criticism and possibly even a fairly important departure from the Finnish firm. 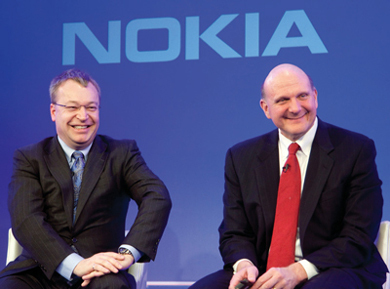 Nokia CEO Stephen Elop (left) with Microsoft CEO Steve Ballmer. From our seat, however, it has mainly led to Microsoft spinning, as always, that this is great news for the channel, specifically for the Windows Phone hardware partners that surely must be wondering now where (or whether) they fit into Microsoft's plans. This sunny channel forecast, of course, is what we always hear from Microsoft, no matter how bad the news actually is for the channel. And we're thinking this acquisition is probably bad news. First, there's the obvious. Are we supposed to pretend that Microsoft won't go down the road Apple has so expertly paved, basically developing and selling its own hardware and software and leaving the channel behind? If not, why spend $7 billion on a maker of handset devices? Stephen Elop isn't worth that much by himself, surely. This is a clear and obvious play aimed at making Microsoft a serious competitor in the handset space using Apple's model rather than what Google is still mostly doing with Android (although the Motorola Mobility buy clearly moved Google in a more Apple-like direction), which doesn't make that much money for Google, anyway, at least not directly. Then, there's Microsoft's recent track record with flailing, desperate moves and alienating the channel. Way back in 2008, as Microsoft realized hosted applications were actually going to stick as a model, the company finally began talking about hosting its own applications. The obvious implication was that it would then be competing with its own hosting partners. That year, Steve Ballmer told a crowd at the Worldwide Partner Conference (the partner conference!) that Microsoft would basically take down its partner-competitors if it had to. Now, Microsoft is nudging the channel aside again with this Nokia deal. However, there is good news for partners, even Microsoft's hardware partners. It might not be obvious, but it's there. First, let's get this out of the way: Most readers here are probably involved in selling and servicing enterprise software of some sort from Microsoft, meaning the likes of SharePoint, Windows Server, SQL Server, System Center and the like. These are huge moneymakers for partners and Microsoft both (and really what the company should be focusing on instead of chasing consumer pipe dreams), and we can't imagine a scenario in which Microsoft would want to hurt its channel for those products in any way. Just the opposite, in fact: Microsoft seems as supportive as ever of these products and the partners that deal with them. So, that's good. But for partners in the line of fire, there's other good news. Mostly, it has to do with Microsoft's (and probably Nokia's) poor execution. None of these desperate, flailing, way-too-late attempts by Microsoft to catch some leader in a consumer market ever seems to work. Bing isn't exactly a household name. Microsoft bought aQuantive years ago in an effort to become an advertising agency and then ended up writing off that little $6 billion foray. The Zune was a non-starter, to say the least. The Kin phone will go down as one of the great gaffes in tech history. The Surface is a disaster. Even the Windows Vista and arguably Windows 8 operating systems, the one thing Microsoft is really supposed to know how to produce, have proven to be flops. And now Microsoft is trying to revive its drooping Windows Phone franchise buy buying a manufacturer that's been mostly irrelevant and ineffective for the better part of half a decade. We'll see how that goes. What we're saying to those few Windows Phone hardware partners not named Nokia is that as it is slowly doing with Surface, Microsoft will probably come crawling back to you at some point. Given Microsoft's failures at doing pretty much anything outside the enterprise or Windows/Office spaces, it seems highly unlikely that Microsoft will be able to successfully integrate Nokia and its 30,000-plus employees (yes, for the time being, anyway, Microsoft is about to get much, much bigger) into a smooth-running machine that will threaten Apple and Google. The more interesting race to watch might be to see which phone brand collapses completely first, BlackBerry or Windows Phone. For a company that still makes most of its money from -- and has built most of business on -- the channel, Microsoft sure seems anxious to cut partners out of its newer ventures. While we don't think that should be a major concern for Microsoft's bread-and-butter enterprise partners, it's certainly a trend that should disturb a lot of players in the Microsoft channel and push them to watch their backs and have contingency plans in case the mother ship turns it guns on them. Then again, when it comes to anything outside its traditional comfort zone, Microsoft usually misses it targets (by a lot), anyway.